Udupi, July 27, 2015: A host of leaders including ministers from undivided DK and legislators paid their last respects to former minister and five time MLA Vasanth V Salian who passed away on July 25, Saturday. The cremation was held with state honours at Katapady on July 26, Sunday, in the presence of a large number of mourners. 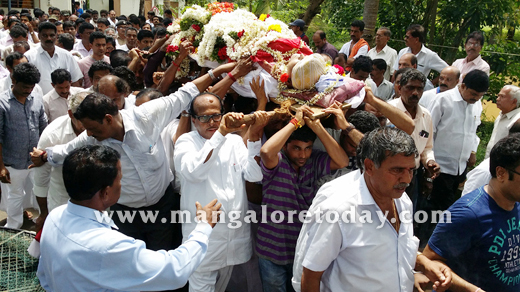 The final rites of Salian were performed by his sons-in-law Kamalaksha Suvarna and Gangadhar Suvarna. Udupi Tahsildar Guruprasad , Additional SP and other officials were present when three rounds of bullets were fired in the air as a mark of respect to the departed d leader. The entire town of Kaup observed a voluntary bundh by downing shutters following the demise of Salian. 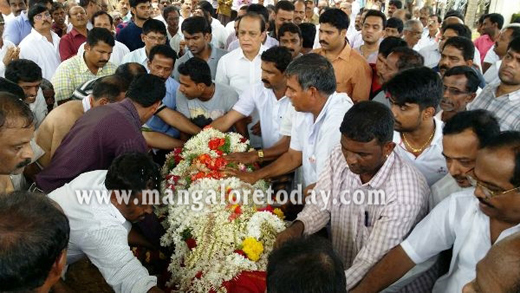 Among those who paid their last respects included State Ministers Vinay Kumar Sorake, Ramanatha Rai, senior leader Janardhana Poojary, MLAs Gopal Poojary, JR Lobo, MLCs Ivan D’Souza, Kota Srinivas Poojary and others.